Rosnay slopes up gently from the south bank of the river (whose largely undammed flows are the life blood of the valley) to the ridgeline and Rivers Road. At 350 metres elevation, Rosnay’s gravelly and sandy clay loam soils are known as “Canowindra porphyry”, and are highly suited to vine and tree crops. The red clay subsoil formed when a volcano erupted to the northeast, depositing ash for hundreds of kilometres over a granitic base. The clay has a high water holding capacity, but also drains readily. Today the remnants of this volcano can be seen 70km to the north-east of Rosnay as Mount Canobolas (1395 metres), the highest point in the Central Ranges, and the highest point west until Madagascar in Africa. The proximity of Mount Canobolas is beleived to contribute to Canowindra’s cool autumn nights, perfect for grape ripening. Richard and Florence also recognised the sense of community within the town and its surrounding patchwork landscape of small farms producing lucerne, lamb, beef, venison, vegetables, cereals, canola, olives, vineyards, cherries, nashi pears, and dairy. 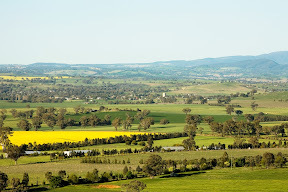 As a wine region, Cowra was widely recognised for its fine Chardonnay, Shiraz, Cabernet Sauvignon, Sangiovese, Semillon, and Verdelho that are doing very well for the regions vignerons, including Windowrie Estate, Pig in the House, Gardners Ground, Hamiltons Bluff, Swinging Bridge, and Wallington. Historically, Canowindra is also a very special place. Originally inhabited by the Wiradjuri people, the first buildings were erected by white settlers in 1846. Canowindra became famous in 1863 when bushranger Ben Hall and his gang held the townsfolk up at Robinson’s Inn, now the Royal Hotel. The first road bridge was built in 1874, and many of the old buildings date from this time. The entire commercial section of Gaskill St has been classified by as a Heritage Preservation Area by the National Trust. Canowindra is also famous for its ancient fish fossils, housed in a beautiful museum. Nearby Cowra has its own rich history and a strong connection with Japan, boasting a delightful Japanese Garden.